Publisher: Ruth Nyaboe April 04, 2019 This information is provided solely as a guideline. Sweet potatoes are typically recognized by their copper-colored skin and vibrant orange flesh, though the hundreds of varieties grown worldwide display colors such as white, cream, yellow, reddish-purple, and deep purple. Although they are often found on holiday tables covered in marshmallows or mixed with added sweeteners, there’s no need! True to their name, sweet potatoes have a naturally sweet flavor, which is further enhanced through cooking methods like roasting. Sweet potatoes are not only readily available, inexpensive, and delicious, it turns out they are also very nutritious and good for your overall health. This root crop is known for its starchy texture and slightly sweet taste is full of nutrients and other health benefits. Plus, it just so happens to be versatile enough to enjoy any time of day and with any meal. Most of the time, the stuff that is good for us doesn’t taste good, but, luckily for you, sweet potatoes are as nutritious as they are delicious! Sweet potatoes are high in Vitamin B6. A vitamin which helps to reduce the chemical homocysteine in your body which has been linked to degenerative diseases including heart attacks. They Are A Good Source of Vitamin C offering support for your immune system, bones, and teeth, digestion and blood cell formation. Sweet potatoes contain small amounts of Vitamin D. A nutrient that helps to build healthy bones, heart, nerves, skin, and teeth, as well as support the thyroid gland. A source of slow-releasing carbohydrates, sweet potatoes provide us with sustained energy. But they also contain iron for red and white blood cell production plus energy. A good source of magnesium, sweet potatoes can help you to relax and de-stress. It's also necessary for healthy artery, blood, bone, heart, muscle, and nerve function. This tuber contains potassium, an essential electrolyte that helps to regulate your heartbeat and nerve signaling, whilst supporting healthy blood pressure. Sweet potatoes are low on the glycemic index, slowly releasing their natural sugars into the bloodstream. So you won't go on a sugar-induced roller coaster. They're also powerful antioxidants that help ward off cancer! 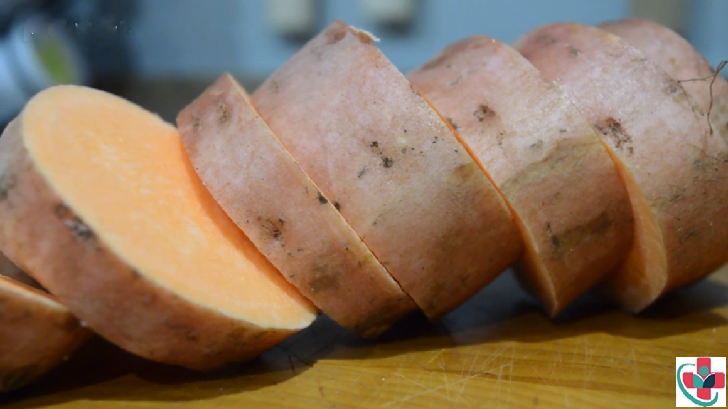 Nutrients in sweet potato impact fibrinogen in the body. Fibrinogen is one of the key glycoproteins in the body that is required for blood clotting. It has a group of resin glycosides called batatins (batatin I & II) that have been shown to have antibacterial and antifungal properties.